What a string of hot, humid days we are having! I keep looking at the weather forecast and asking, when will this break?? My lawn is drying out, my veggie garden refuses to grow, and my dog hides in the shady corners of the house. Even I feel less motivated to move around these days, although I still make sure to get out for a walk, hike, or bike when I can since summer is when Vermont has those gorgeous blue sky days that we long for in the wintertime. The dangerous thing about being outdoors at this time of year is the humidity – it affects you more than you think! Heat and humidity lead to two problems in the body – increased core body temperature and dehydration. Increased core body temperature decreases your muscles ability to contract repeatedly, so it becomes more difficult to sustain an activity for a longer period of time. High core temps also shift your energy production from aerobic (requiring oxygen) to anaerobic (without oxygen), which means the body uses up its muscle energy stores more rapidly as added energy that you get from eating requires oxygen to break it down. That means that eating while exercising does not keep up with the rate of losing energy when heat and humidity are high. Finally, high core temperature decreases the return of blood to the heart, so then even less oxygenated blood is pumped back to the muscles that are working. 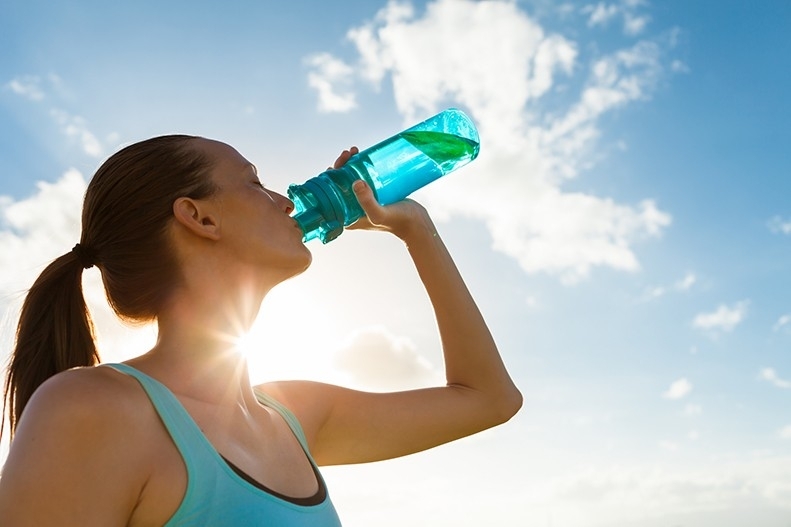 Dehydration is large problem as water makes up about 60% of the adult human body as whole. Certain organs have a higher water percentage – the brain & the heart are 73% water, the lungs are 83% water, and muscles are 79% water. All of these important organs need to maintain their percentage to function properly. Exercise can cause you to lose as much as 2-8 % of your body weight, with the majority of that being water through sweat, which increases in higher temperatures. As you become dehydrated, your body becomes less efficient at regulating core body temperature and leads to the changes mentioned above. Dehydration also decreases overall blood volume and blood pressure, so it becomes even harder to get oxygenated blood to your muscles and other tissues. Lastly, dehydration decreases the amount of fluid between the cells of your body that is essential for transporting nutrients to the cells and carrying waste away from the cells. A build-up of waste can cause systems to shut down. Hopefully this information will help you stay hydrated through the rest of the summer – here’s to hoping things cool off just a bit!